Dr. and Mrs. Dennis Hiramatsu came by the Museum from Winters, CA, and brought photos of his personal Mustang. He and his dad restored this 1949 Mustang Model 2 “when he was a kid.” He sold the Mustang to a neighbor (so it hasn’t gone far). I sold a motorcycle once, Dennis, and was so sorry that I never sold another — and you see what happened! I have a real live Mustang on the floor here. Dennis bought the 2013 CSC Mustang to honor his dad. 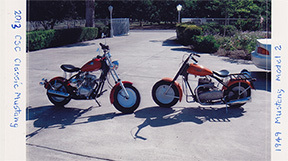 It’s the one on the left in the photo of both bikes. This entry was posted in Motorcycle Museum: Visitors to the Museum on 7 September 2015 by oldgeezer.